Properties in Carteret County average 4.7 out of 5 stars. Clean, New and Bright Studio Condo With Extras For Your Perfect Vacation!!!!! Property 2: Clean, New and Bright Studio Condo With Extras For Your Perfect Vacation!!!!! Charming, Updated Studio Apt. Just Steps to the Beach! Property 4: Charming, Updated Studio Apt. Just Steps to the Beach! Rooftop deck overlooks front street! Property 12: Rooftop deck overlooks front street! Studio Condo located on the ocean side of Atlantic Beach waiting for you! Property 13: Studio Condo located on the ocean side of Atlantic Beach waiting for you! Oceanside, completely remodeled one bedroom efficiency w/beach access & pool! Property 14: Oceanside, completely remodeled one bedroom efficiency w/beach access & pool! Charming Marshallberg Apt w/ Water Views & Dock! Property 21: Charming Marshallberg Apt w/ Water Views & Dock! Property 30: Beautiful place to stay by the beach.Come on and put your toes in the sand! Water access - new STUDIO APARTMENT - AFFORDABLE!! Property 34: Water access - new STUDIO APARTMENT - AFFORDABLE!! Oceanside, remodeled, one bedroom efficiency w/beach access and pool! Property 38: Oceanside, remodeled, one bedroom efficiency w/beach access and pool! Property 39: Oceanside, one bedroom efficiency w/beach access and pool! Property 40: Oceanside, completely remodeled one bedroom efficiency w/beach access & pool! Property 41: Oceanside, one bedroom efficiency w/beach access and pool! Oceanview 2BR sleeps 6 Great Beach Access! Property 42: Oceanview 2BR sleeps 6 Great Beach Access! East Coast best kept secret getaway spot. Condos and studios property available. Property 44: East Coast best kept secret getaway spot. Condos and studios property available. Spacious Studio at Green and Smith Creek. Property 45: Spacious Studio at Green and Smith Creek. Historic Swansboro Studio w/ Porch & Bay View! 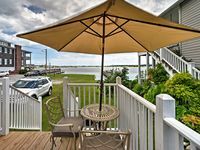 Property 48: Historic Swansboro Studio w/ Porch & Bay View!